… and why shouldn’t he? On this one stalk alone he’s found enough sweet satisfaction to last all day. I know I’ve complained in the past about the lack of care shown for the LAPD’s landscaping, but I’m happy to report they seem to have resolved most problems. Still some linger: beds are still overplanted and choked with weeds … and worse of all, a grove of once-gorgeous Desert Museum palo verde trees seems to either be falling spontaneously — tree by tree — or being uprooted. 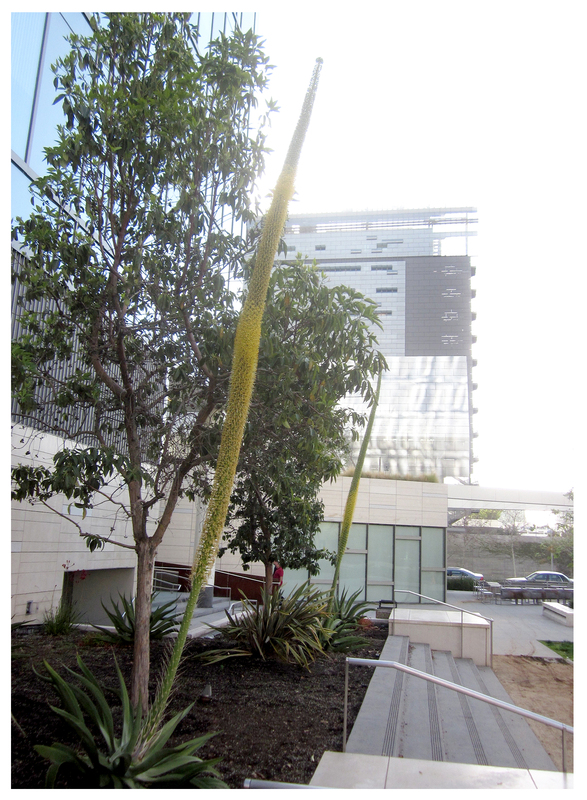 Here’s a picture link showing the palo verdes their first spring at the LAPD … standing tall and in spectacular bloom … Sadly, this year none have bloomed. 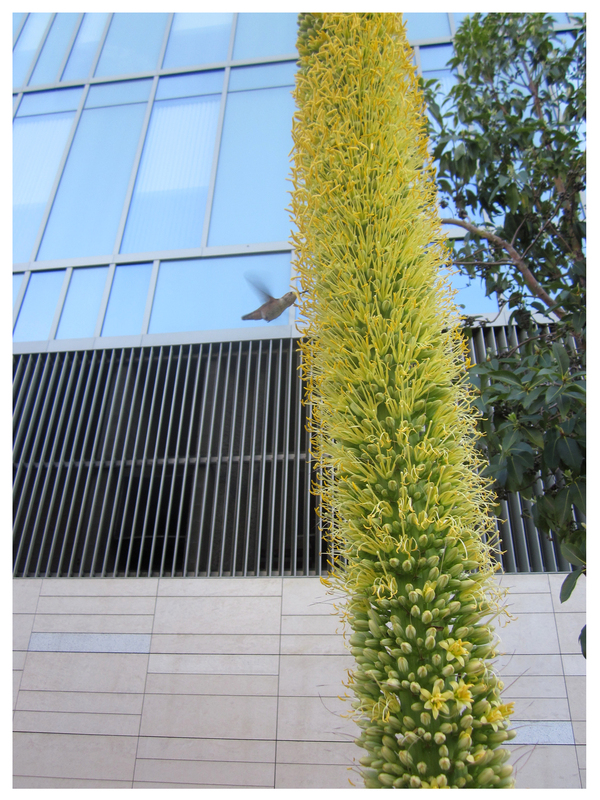 I’ll content myself for now with these agaves and their golden stalks, although it’s a contentment tinged with sadness … Like most, once these agaves bloom they will die. I hereby pledge to honor them with a visit every day before crossing the street and heading up to my office! Arresting indeed–as are your photos! They have some A. vilmoriniana where I work and they are so beautiful and tall and covered in bees and hummingbirds that I promised myself I’d buy a few at the plant sale this weekend. They’re also one of the few that seems to be resistant to the Agave snout nose weevils. Gorgeous and weevil-resistant? I’m in love … I lost so many agaves last year I will definitely be adding some of these beauties in their fallen comrade’s places. I have a question not actually related to this blog post, though the agave reminded me of my question. I am building a school garden with my students right now. Outside of one of the classrooms (unconnected to my garden) is a raised bed overflowing with aloe vera. I want to transplant some of the aloe vera into my garden both to have it in my garden and to prevent the aloe from choking itself to death in the raised bed. 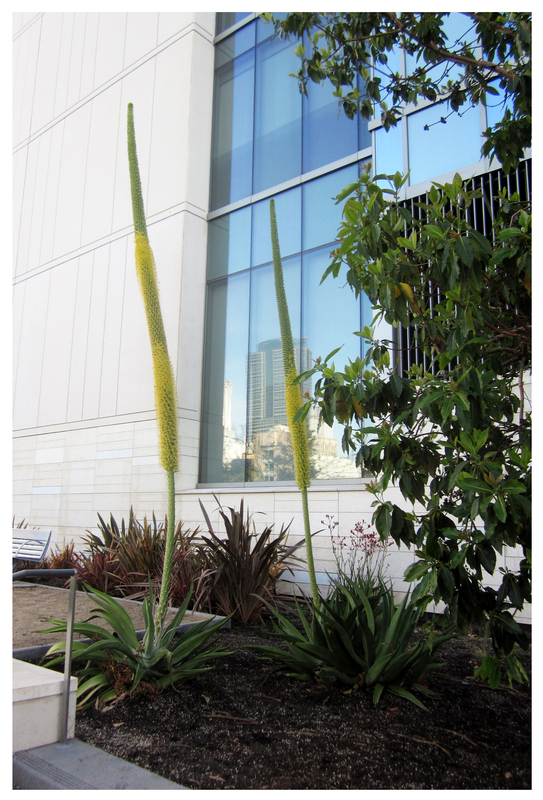 What is the best way of transplanting aloe vera? do you have tips on this? Well, Nisha, I’m no expert … but my usual tactic is to dig up all or part of the aloe I want to move or transplant. Then separate the plant where it seems to clump naturally (if not with my hands, with a knife or kitchen shears). Then just plant it where I want it. My love of succulents really does stem from the fact that they’re non-fussy and easy to grow: I dig a hole and plant them … when they get too big for their britches I dig ’em up and move ’em. Simple. Let me know how it goes! Oh! and i LOVE the hummingbird shots! Cool, glad you found it helpful, Nisha! I’m with you on the ease of succulent transplantation. I took a ton of cuttings to the RRFM at Fairmount Park this afternoon. Everyone is amazed that you can just put them in the dirt and they grow! Truly the most awesome plants to garden with … this is why and how I can use them as design elements so easily! So do love your pics… I’m always wishing that I could remember to take my camera. I’ve had so many generations of hummers here that they don’t always dart off when I’m watching them. But I usually notice them while I’m working on something else, So i’ll just enjoy yours. 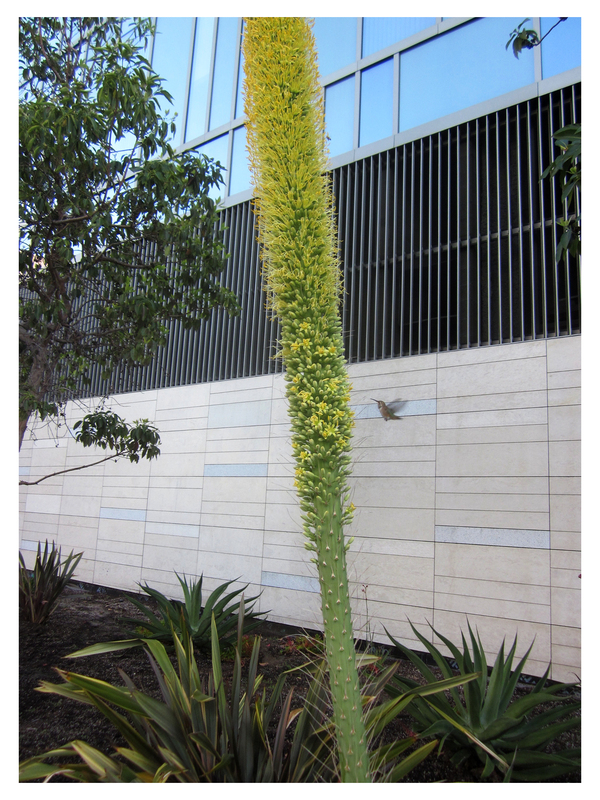 Those aloes are incredible… Do agree about succulents. The more I learn about them the more I like them. My policy on succulents now is: Just when you think you’ve seen it all, there’s more … and I have to love ’em for that!